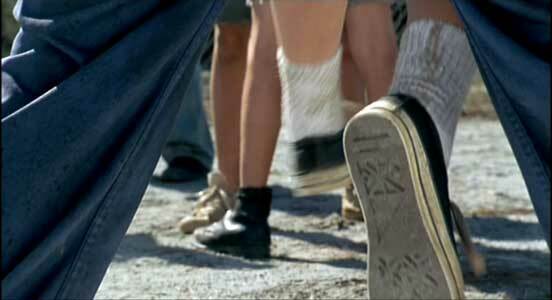 Elijah Wood and Brennan Gallagher wear white and black Converse “Chuck Taylor” All Stars in the film. 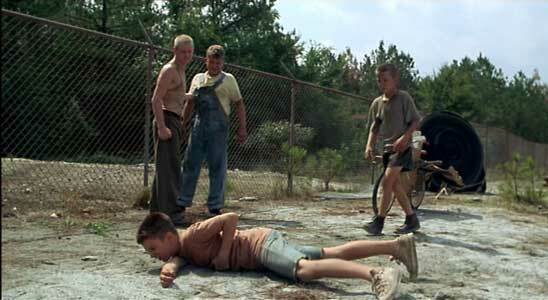 Stu is bullied by the the Lipnicki brothers. The War takes us back to the Viet Nam era. The film is set in rural Mississippi in a small and very impoverished town called Juliette. 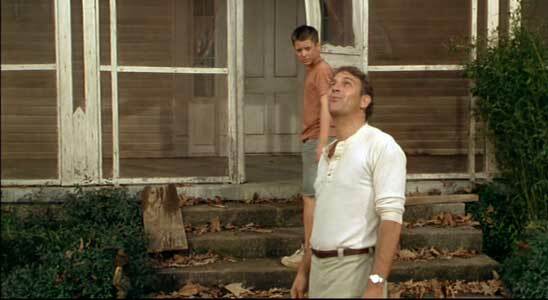 There we meet the Simmons family, consisting of Stephen (Kevin Costner) a shell-shocked Viet Nam veteran who has been unable to hold a job since returning from duty, Lois, the mother who tries to hold everything together by working double shifts as a waitress, and their two children, Stu (Elijah Wood) and Lidia (Lexi Randall). The story is told in the form of a reminiscence from Lidia, who describes how their lives were changed in the summer of 1970. The long hot summer is just about to begin, and Stu’s plan is to build a huge tree house fort where he can his buddies, Chet (Adam Henderson) and Marsh (Brennan Gallagher) can hang out. Lidia want to be involved also, and although Stu and his friends are against the idea, she is able to buy her way in by challenging Stu to a race and then winning. So now Lidia and her two black girl friends Elvadine (LaToya Chisholm) and Amber (Charlette Julius) are in on the tree house. The six are soon fighting over who is in charge, but when the girls are able to score all kinds of furniture and accessories (from the local junkyard on another dare) they are now in charge. Lidia ties Stu in the race, so both the boys and girls get to build the tree house. Stu, Marsh and Chet devise a way to have fun with an old sidecar. The final battle, the actual war in this film, comes to a head over the tree house. The kids first fight for it in conventional ways, and then with real weapons like smoke bomb, mortars, and even Molotov cocktails. Finally the ultimate challenge comes with the oldest Lipnicki brother and Stu deciding to compete for the ownership of the tree house in a tall and decrepit water tower with a whirlpool that regularly discharges waves of water in its vortex. Likewise, there are some serious changes that happen for the Simmons family. How all of these story lines resolve makes up the balance of the film. Stu and his dad Stephen look over a house up for auction that Stephen wants to bid on. While The War presents us with a coming of age story for the Simmons kids, and the struggles of the Simmons family as they try to recapture the life they had before Stephen Simmons war service, it also presents us with “messages” on a regular basis. While there is nothing wrong with these ideas, they sometimes intrude into the reality of the story, because they are really the thought processes of adults and not adolescents. The War is meant to follow in the footstep of director Tom Avnet’s previous success Fried Green Tomatoes. 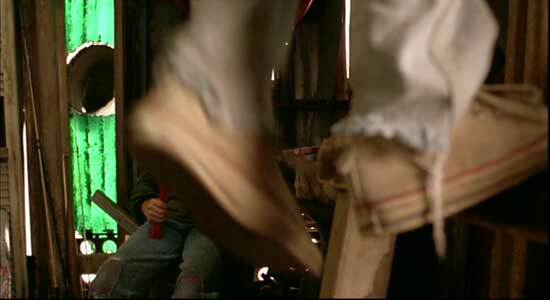 It’s overall impact would have been better served if the audience was given more of a chance to figure the messages out on their own, like we saw in Fried Green Tomatoes, or other similar movies like Forrest Gump. Sometimes in a film, actions speak louder than words, but in the world of The War we get both. The conceit in this film is that the war veteran father is preaching non-violence, while the actions of the younger generation becomes more soldier-like as they escalate into more and more violent behavior. While Kevin Costner underplays his role, and makes an effective rationale for his case through non-preaching, there are several scenes with the kids that seem overplayed and too adult-like in behavior for kids from dirt-poor families. Their messages are delivered loud and clear, but in reality only a very exceptional kid could be that articulate and for that matter choose to express those particiular opinions. Nevertheless, The War is filled with good performances, and is well cast. Lexi Randall, Elijah Wood, LaToya Chisholm and Lucas Black (as Ebb Lipnicki) stand out in the children’s category, and despite limited screen time Mare Winningham is very good as Lois Simmons. It has some flaws, but for the most part The War gives us solid family entertainment. Stu struggles to get the lock back after the Lipnicki’s throw it on the water tower. Marsh gets shaken up by one of the Lipnickis. 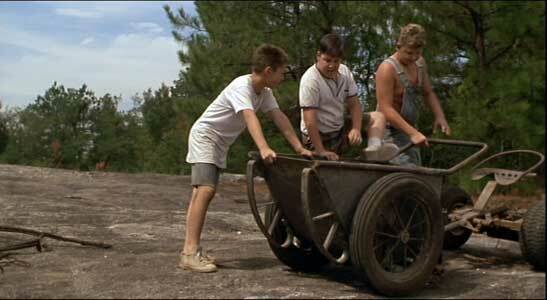 Elijah Wood, in his role as Stu, wears dirty white high top chucks throughout the film, and his friend Marsh wears black low cuts. Stu’s high tops look like they have been cut along the top, as you see the ankle patch right at the top of the uppers. In today’s society they would be worn as roll downs. The best shots come during some fight scenes with the rival Lipnickis. Stu climbs up and down the ladder during the battle. The War. (1994) Kevin Costner, Elijah Wood, Mare Winningham, Lexi Randall, Christopher Fennell, Donald Sellers, LaToya Chishom, Brennan Gallagher. Directed by Tom Avnet. Categories: Drama, Family, Coming of Age.